These are the fishing regulations in brief. For a full report of the regulations, it is best to download the latest publications from the MNR. If you are over 18 years of age, you need an Outdoors Card and fishing license to fish in Ontario. 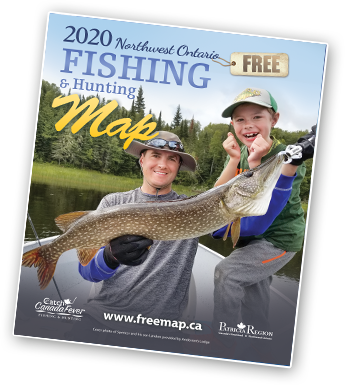 You can purchase a license at any number of camps, outfitters and stores in Ontario. Cost of licenses are covered here. Conservation License has lower limits on the number of fish you can catch per day than the regular license, but is less expensive. The regular license has increased limits on the number of fish you can take, but both types of licenses are restrained by size limits on certain species. Remember that all limits are per person, and a conservation license for each person is normally fine for most groups. Using a conservation license also helps ensure that Canada's Heartland fantastic fishing continues to thrive. Bringing your catch outside of Ontario is allowed. Here are the guidelines for exporting fish. Fish you store for transportation must be identifiable, easily countable (for possession limits), and length must be easily determined (for size limits). Leaving a bit of scales on the filleted fish is a good way to keep them identifiable. 1.Catch within your legal limits and release all but one trophy for mounting. 2.Keep the smaller ones for shorelunch or home. 3.Release the medium to larger fish to spawn and fight again. It is certainly a pleasure to see the smile on the face of an angler who has just caught a "big one" or watch one of their children hoist a "lunker" into the boat. To ensure that this smile will also grace the faces of your children and grandchildren we suggest you put some of your catch back. Please remove the hooks carefully, handle the fish tenderly and, with satisfaction, return your fish to the water. Barbless hooks facilitate easy removal and minimize the damage to the fish. Most mortalities among released fish occur as a result of excessive bleeding when hooks have been embedded in the gullet or gills. Many of the fish hooked in these areas are released only to swim away and die. Safe removal of barbed hooks from such sensitive areas is difficult if not impossible. we recommend that the barbs on your hooks be filed off or pinched down with pliers, allowing safe and harmless removal of the hook. Play it like a true sportsman. Carefully release the fish properly after the catch. Keep our waters a sportsman's paradise. And come back next year to enjoy the fishing. "The future of fishing is in your hands."